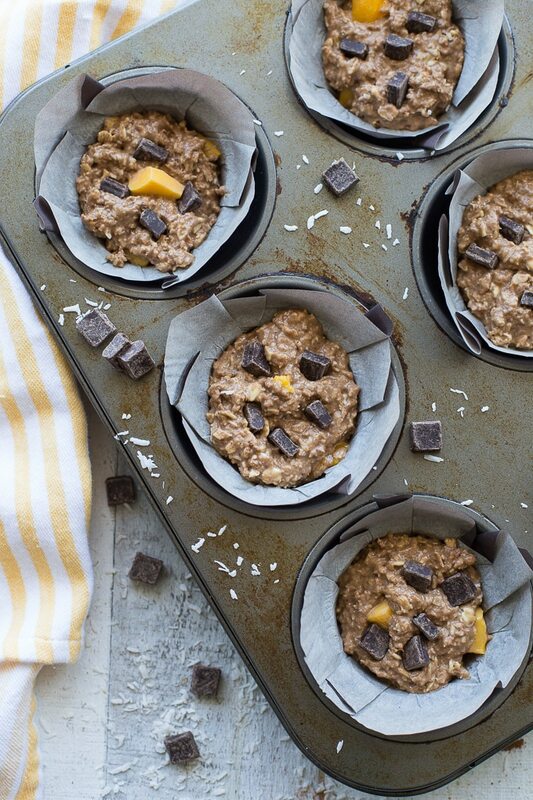 Bringing a little goodness to your morning with these Coconut Mango Oatmeal Muffins. They’re made with clean eating ingredients, so they make a wholesome snack or on-the-go breakfast. And they’re stuffed with mango and coconut, so you get a little taste of the tropics too! Mother’s Day is this weekend! What are your plans for celebrating? I’m actually in Utah at the Everything Food Conference, and travelling home on Sunday, so I’ll miss Mother’s Day. But if I was home, I would probably be brunching it up, and these Coconut Mango Oatmeal Muffins would definitely be on the menu. Any time I host a brunch, I always love to add a basket of muffins to the table. It makes brunch feel more like a picnic than a formal meal. And who doesn’t love a springtime picnic?! Plus, muffins are easy to make ahead, so you can bake up these beauties the day before and have one less thing to worry about the day of your get together. The recipe for these Coconut Mango Oatmeal Muffins is actually a spin on two other muffin recipes I have on the blog – Blackberry Lemon Overnight Oatmeal Muffins and Cranberry Orange Overnight Oatmeal Muffins. While I always change-up the add-ins (i.e. fruit, nuts, coconut, citrus zest), the muffin base is always the same – oats soaked in almond milk. This technique requires a bit of planning, but it helps keep the muffins cakey and moist. I changed up the recipe slightly for these Coconut Mango Oatmeal Muffins by using rolled oats instead of steel-cut oats. This results in a less nuttier texture, but it saves time as the rolled oats only require 30 minutes to soak. But you could totally use steel-cut oats if you prefer a nuttier texture. Just be sure to soak the oats longer. (I usually do this overnight). Instead of citrus zest and juice, I added vanilla, maple syrup and raw cacao powder for taste. I didn’t always appreciate this, but cacao powder is different from cocoa powder, which is what I normally use for baking. Both cocoa and cacao powder come from the same source – the cacao bean – but cacao is processed at a much lower temperature, so it’s considered less processed, keeping more of its raw qualities and nutrients. It’s also a good source of fibre and iron! I like to add the vanilla and maple syrup to the oats while they’re soaking in almond milk so the flavour infuses with the oats. You can use fresh or frozen mango. If using frozen mango chunks, just let them defrost a bit before adding them to the muffin batter. Also, cut your mango chunks small (even smaller than pictured here) so there is plenty to disperse throughout the muffins. 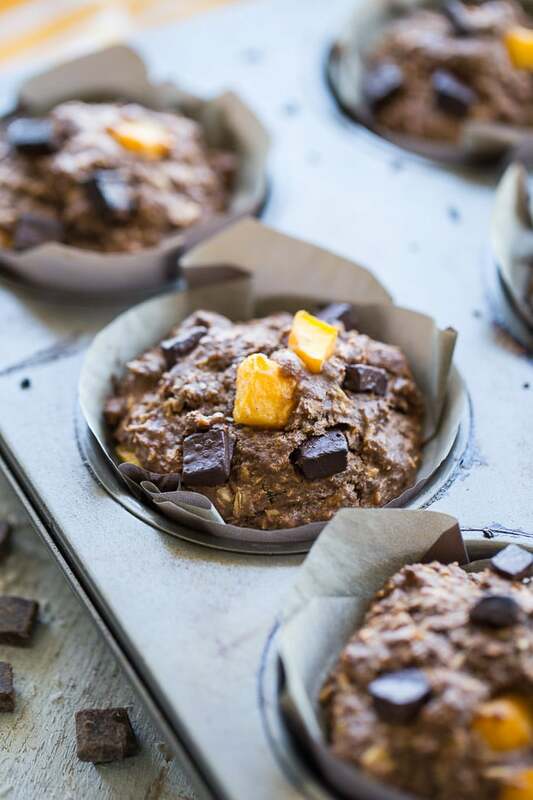 These muffins are not overly sweet, so if you prefer a sweeter muffin, you can use cocoa instead cacao powder, and/or substitute sweetened coconut for unsweetened. Just note that the muffins won’t be as clean eating. And when it comes to coconut, I like using shredded (as opposed to medium, fine or flaked), as it adds a nice texture to the muffins. This recipe makes 6 jumbo muffins, but if you want smaller muffins, use a 12-cup muffin pan and reduce the baking time to 15-18 minutes. That’s it for now! I’m hitting publish on this post, and getting ready for another full day of food blogging sessions! Have a wonderful Mother’s Day weekend! 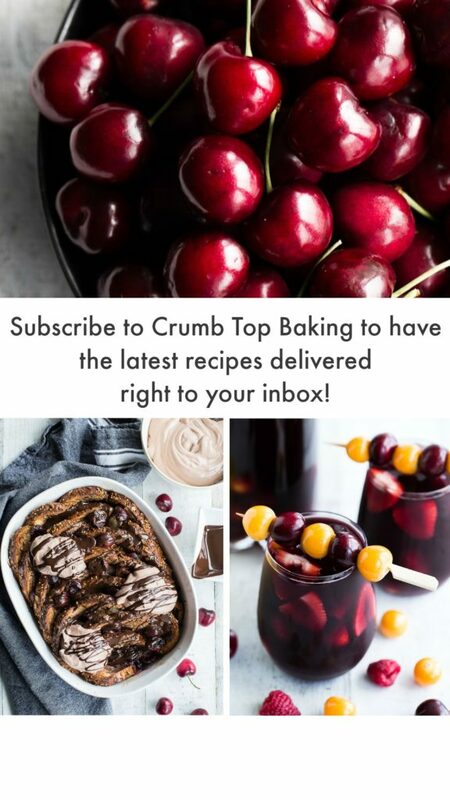 And if you make these muffins for brunch, or even for a road trip or part of your Sunday meal prep, be sure to let me know in the comments below or take a pic and tag @crumbtopbaking on Instagram! In a small bowl, add the oats, almond milk, vanilla and maple syrup. Stir until combined. Cover and refrigerate for 30 minutes to allow the oats to absorb the milk. 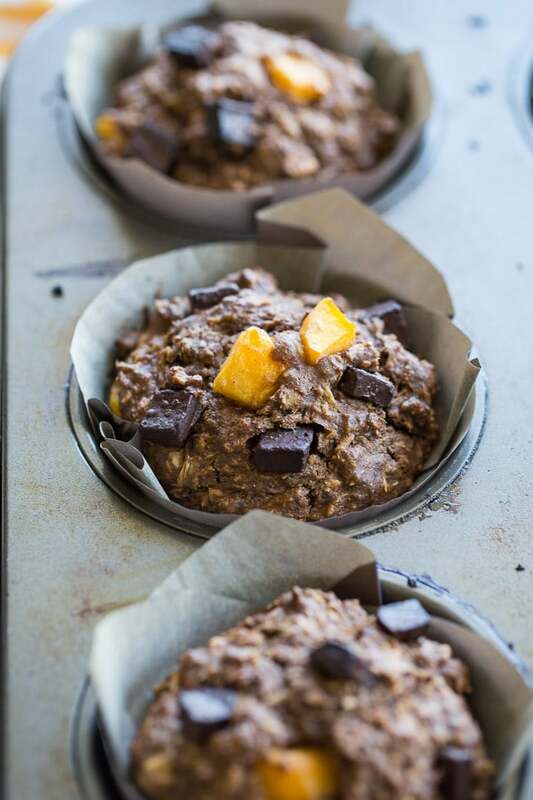 Once the oats are soaked, pre-heat the oven to 425 degrees and grease a large 6-cup muffin pan. (You can also use cupcake liners). In a medium-sized bowl, whisk together the egg and olive oil. Add in the oat mixture and stir until combined. In another medium-sized bowl, sift together the flour, sugar, cacao, cinnamon, baking soda and salt. Add the dry mixture to the wet mixture and stir until combined. Do not over mix. 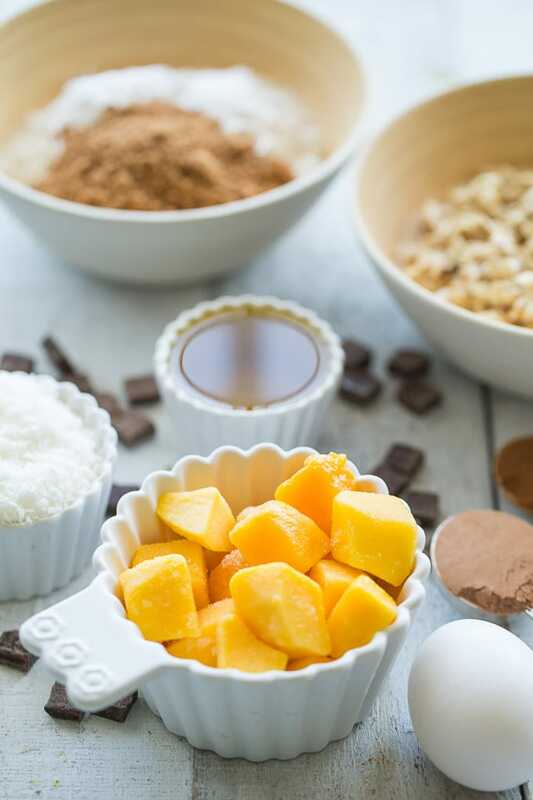 Fold in the mango, chocolate chunks and coconut. Using a large ice cream scoop, fill the muffin cups with the batter. Bake for 23-25 minutes, or until a tooth pick inserted into the muffins comes out clean. Remove from the oven and let sit for 5 minutes before transferring to a cooling rack to cool fully. Muffins will last in an airtight container on the counter for 4-5 days or you can also freeze for later enjoyment. This recipe makes 6 large muffins. If you prefer smaller muffins, just use a standard size 12-cup muffin pan and bake the muffins for 15-18 minutes, or until a tooth pick inserted in the middle of the muffins comes out clean. There’s so much to love about these muffins I don’t even know where to begin! The mango, the coconut, and those big chunkc of chocolate! Yum!! I love muffins too and love that I can prepare in advance so less to do on the day of if brunchin’! We are actually having a mother’s day brunch this weekend so looking forward to that! I’m all about all things coconut…and, well, chocolate so these are definitely up my alley. Have lots of fun at the conference and eat lots of good food (I’m sure you will 😉 ). Thanks Dawn! It was a great conference! Hope you had a lovely Mother’s Day weekend! Ive never had mango in muffin before! Thanks for the awesome inspiration! I love this. Thanks Jen! Mango in muffins is definitely worth a try! Hope you get to make them! Thanks Christina! I was excited to meet other bloggers, and all of the speakers were so informative, covering topics from Instagram and Pinterest to food photography and editing. I’m so glad I went! Have a great weekend! Bringing all the goodness with this one! Coconut Mango is a favorite flavor combo of mine!! These are spectacular! Thanks Annie! Glad you like the combo! I will never have enough ways to enjoy mango. It’s easily one of my favorite fruits. These sound incredible, Leanne! Thanks Kelsie! We eat a lot of mango in our house. I buy it frozen and add it to smoothies and muffins all the time! Hope you had a great time at the conference Leanne! You’ll have to let us know! Love these muffins! Perfect start to the week! Love the tropical flavors! Hope you enjoyed the conference, Leanne! 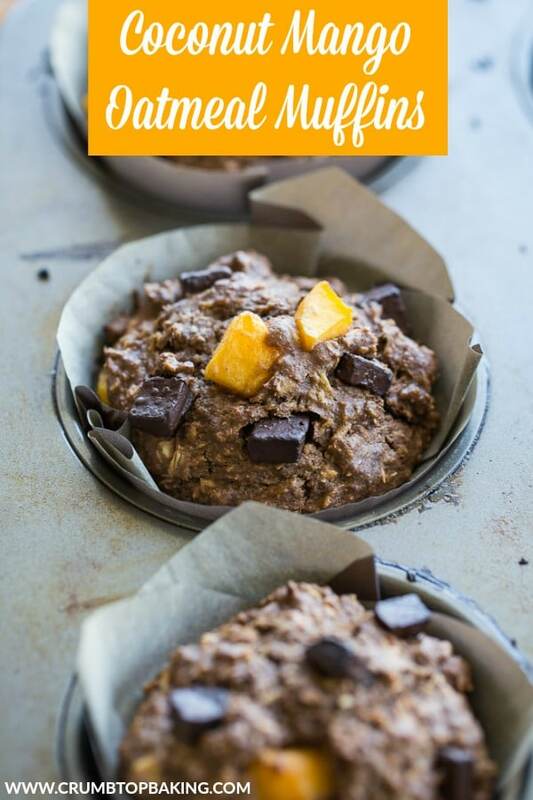 These muffins are not only absolutely delicious but also clean eating! What else could you want? I love the wholesome ingredients in here and the fruit combo is awesome! Thank you Nicoletta! I always like to keep the muffins I make wholesome and clean eating. Glad you like the combo of ingredients! Definitely making this, that looks so good! Love the healthy ingredients too. Thanks Gabby! I hope you like them! 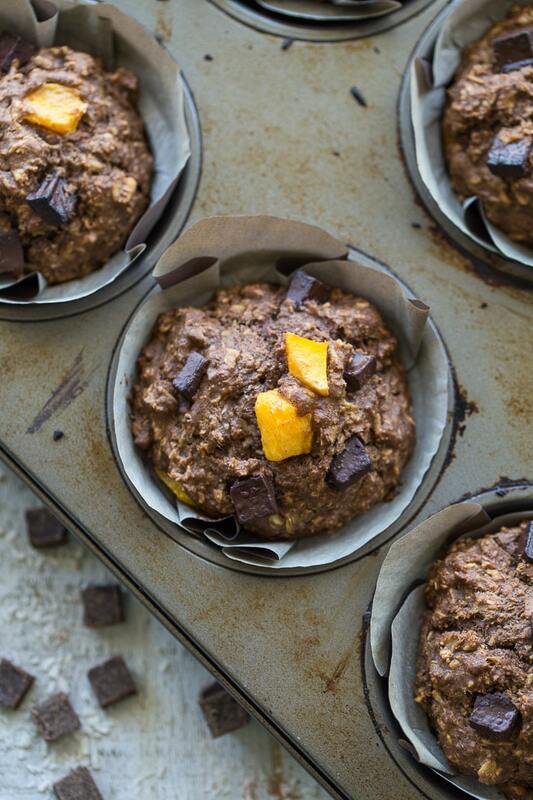 I love having both mango and chocolate in my muffins! I have to admit that I don’t love coconut as much…mainly because hubby doesn’t love it. BUT I can certainly see if it will work out. I am looking for more breakfast muffins so this would fit the bill nicely! Thanks Lillian! I add coconut to most of my baked goods, but you could totally make these muffins without the coconut. Hope you get a chance to give them a try! These would make such a nice, hearty breakfast. You can’t go wrong with mango and coconut! Thanks Nicole! They really make a filling breakfast or snack! Happy weekend! I don’t think these muffins would have a chance to get cold. Oh my, they look amazing and I can smell the mango!! I’ve got to make them!! Thank you Lily! I’ve definitely enjoyed a few of these warm, right out of the oven! I hope you like them as much as we do! Thanks Heather! The conference was awesome! It was so fun sharing some highlights on Instagram Stories. Have a great weekend! Mmmmm….. Muffins & they have dark chocolate in them as well! Okay breakfast or a snack seriously can not be this good, but it is! I am going to make these & also make sure that my family doesn’t end up eating them all up before I have a chance to try them. The first part will be the easiest. Wish me luck! Haha! Good luck! Let me know what you think if you make them! Thanks Ashika! 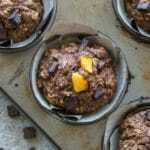 The mango works really well in these muffins, and pairs nicely with the coconut and chocolate chunks. I’m glad you like them! These look so good Leanne! I love your overnight muffin recipe so I know I’ll love these too. Mango with coconut is classic!’ Hope you had a wonderful time at the conference. Maybe I’ll join you next year! Thanks Katherine! Yes, I always go back to my overnight oats muffin recipe. It just works so well! The conference was great! Definitely worth looking into for next year! I hope you had a great time at the conference Leanne! I went two years ago and had a great time, but I didn’t get to go this year…I would’ve loved meeting you! These are the prettiest muffins and need to try making muffins out of overnight oats. I’ve done it with baked oatmeal and loved it so I need to try muffins now! Thanks Marcie! It would have been lovely to meet you too! You have such great overnight oat recipes, so I know your version of overnight oat muffins would be awesome! I love this combination of flavors Leanne! Tropical and chocolatey! Those big chocolate chunks make me so happy. I’ve never tried soaking oats before and this sounds like the recipe to try it with :). Thank you Ann! I love the tropical vibe of these muffins! And of course, you can’t go wrong with chocolate chunks! I hope you get to try this recipe! Thanks for your feedback Cristy. I’m definitely planning to test my overnight oatmeal muffins with an egg replacement. Stay tuned! First time I’ve ever commented on a recipe but these turned out so good and were so easy to make. Thanks for posting. I substituted dark brown sugar for the coconut sugar and mini semi-sweet chocolate chips for the cacao and the chocolate chunks. Dropped some off to my daughter and her boyfriend. Received text message later in the day, “Best muffins ever.” I will definitely try some of your other recipes. Thank you so much Lil for leaving a comment and letting me know how they turned out! That totally made my day! I’m so happy that you and your daughter and her boyfriend liked them!